Richard A. Posner, Economic Analysis of Law, 9th Edition. Richard A. Posner, Economic Analysis of Law, 9th Edition. Wolters Kluwer Law & Business, 2014. ISBN: 9781454833888. 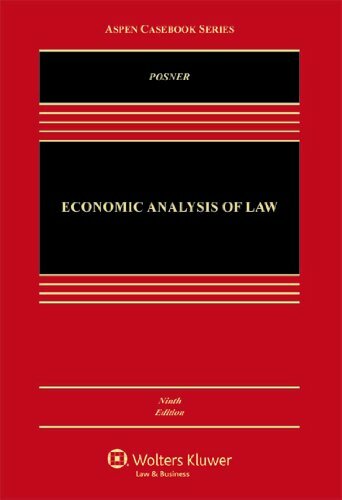 Lucid, comprehensive, and definitive in its field, this text covers every aspect of economic analysis of the law. Two new chapters, one on intellectual property, one on international and comparative law, both exploding fields of great importance. Earlier editions’ questions have been converted to answers, making the book more accessible and informative. Revised to be clearer and less technical. More eclectic, reflecting recent criticisms of “rational choice” theory, in particular the need to supplement it with insights from psychology. Greater attention paid to judicial behavior, realistically modeled and explained in economic terms. Incorporates insights from the veritable explosion of books and articles published in the last few years on economic analysis of law. Richard A. Posner is a judge of the U.S. Court Appeals for the Seventh Circuit, and a senior lecturer at the University of Chicago Law School. He is the author of numerous books, including Overcoming Law, a New York Times Book Review editors’ choices for best book of 1995 and An Affair of State: The Investigation, Impeachment, and Trial of President Clinton, one of Times‘ choices for Best Book of the Year in 1999 and a Los Angeles Times Book Prize Finalist, 2000. Francis Fukuyama: Political Order and Political Decay: From the Industrial Revolution to the Globalization of Democracy.